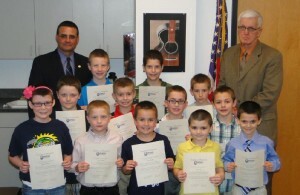 OSWEGO, NY – The Oswego City School District Board of Education and Superintendent of Schools recognized the contributions of Oswego students who shaved their heads for St. Baldrick’s Day in the effort to fight childhood cancer. Students attending the recent board meeting ceremony included (front left to right) Emily Bradshaw, Joe DiBlasi, Devon Tonkin, Jack Hall and Ryan Bartlett. In the second row are Carson Colucci, Spencer Stepien, Demetri Pappa and Adam Michalski. In back are Superintendent of Schools Bill Crist, Nolan Busch, Avery Croucher, Tyler O’Grady and Board President William White. Several other students also participated in the program, but were unable to attend the ceremony.